One of the most tedious tasks at home is doing the laundry. Now, with the help of modern home washer and dryer, washing clothes has become easier throughout the years. To help clean our linens and clothing, there are hundreds of washers and dryers. Additionally, people can choose from thousands of laundry soaps or detergents in the market. Laundry detergents are very helpful. Detergents attract and repel dirt from the clothes. Then, rinse the dirt away without doing damage to the fabric. All laundry detergents do their job in cleaning the clothes. However, not all of them are created equal. Whether powdered, single dose or in liquid form, detergents are very complex. Each form has different strengths and weaknesses. Liquid laundry detergents are more effective in washing off greasy and oily stains. They are even used to remove the stain. The problem with using liquid detergents, however, is using too much per load or ‘overdosing’. This can harm the fabric of your clothes and, at the same time, a waste of money. On the other hand, powdered detergents are best used to treat mud stains and ground dirt. Powdered detergents, however, are hard to dissolve. Most powdered detergent soaps need to be used with lukewarm water. Meanwhile, single dose packs are the most expensive but they are the easiest to use. They are very convenient especially when you do your laundry in a community laundry room or a laundromat. You may need to use more than one pack to clean really dirty clothes or when you are washing more than one load. Many people think that detergents only differ in brands. In reality, there are more to consider than brand names and the scents of laundry detergents. First of all, you have to determine what you and your family needs. Buying the right detergent for your laundry will involve looking at some factors. Efficiency in Cleaning – Make sure that you get what you paid for a detergent. Some laundry detergents are more expensive than others. It does not mean that they are more effective. Test laundry detergents to find out which one is best for your needs. Allergies – Does anyone in your family have skin and other allergies? Children have more sensitive skin so their clothes should use less scented fabric softener and detergents. It may be best to go for scent- and dye-free laundry detergents. There are also specially formulated non-irritating laundry detergents that you can choose from. High Efficiency (HE) and non-HE – Check your washing machine. There are washing machines that are labeled “HE” or High Efficiency. These machines use less water and need to use laundry detergents formulated for them. Use “HE” labeled washing detergents for “HE” washing machine. Scents – Most washing detergents are scented these days. Whether you are using the powdered, liquid or single dose packs, you have to consider their scents. Consider that some people in your family or in your office are very sensitive to certain smells. Highly- scented detergents may trigger allergies. It is not advised to use highly-scented laundry detergents around newborns and infants. Get a sniff of Moonlight Breeze. Gain Flings Original Laundry Detergent Pacs is powered by Oxi and Febreeze to fight stubborn stains and ground-in dirt. Gains Flings will leave you with clean and good smelling laundry. Gains guarantee that the scent lasts. Each pac is usable in any laundry set-up. The pacs easily dissolve in hot or cold water. Gain Flings is compatible with HE and non-HE washing machines. 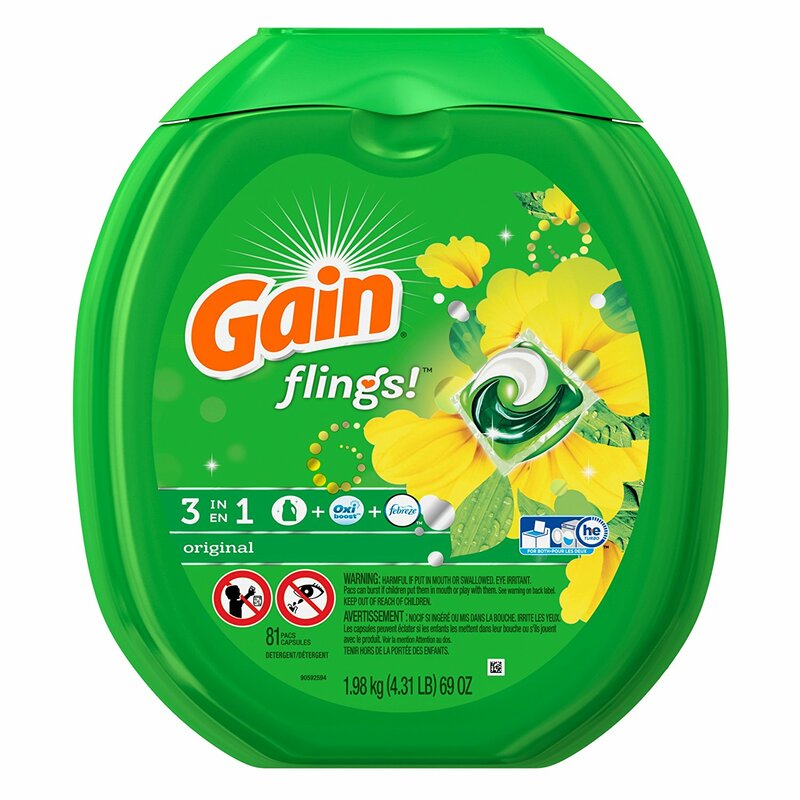 If you are looking for laundry detergent to keep your clothes free from stains and dirt, Gains Flings will help you remove them in one wash. Gains Fling is powered by Oxi and Febreeze formula to effectively take out stubborn stains, dirt, and odor from your laundry without damaging the fabric. At the same time, Gains Fling will leave you with fresh and nice smelling clothes. Gains Fling is also easy to use. It will dissolve quickly in hot or cold water. It can be used in any laundry set-up and both HE and non-HE washing machines. Gains Fling is your perfect laundry partner. The powers of all Powercore liquid and powdered detergents come together in one single pac. The all Powercore Pacs Laundry Detergent is tough not only on dirt and stains but also against odors. Each pac has the power to brighten the colors of your laundry load and whitens your white fabrics. 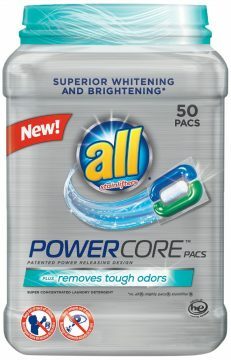 The all Powercore Pacs will keep your clothes bright and leave them with long-lasting scent of freshness. Do you have white sheets with stains on it? The all Powercore Pacs Laundry Detergent is capable of washing off stubborn stains and dirt. You don’t need to measure how much detergent to use every time you load a laundry. Each pacs is capable of cleaning, brightening, and removing tough odors from your laundry. Save more time and money with 50 pacs of all Powercor Pacs Laundry Detergent Plus Removes Tough Odor. 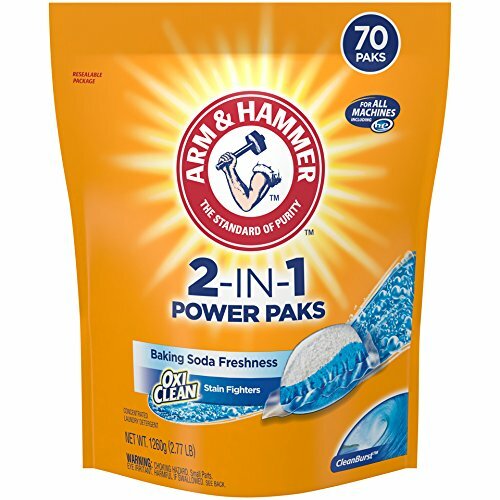 The only laundry detergent packs with bi-layer technology, Arm & Hammer 2-IN-1 Laundry Detergent Power Paks can leave lightly and heavily soiled clothes clean and bright. With the combination of baking soda and OxiClean Fighters, each power pack will turn your soiled laundry into clean, bright, and fresh clothes. It is very easy to use in standard and high-efficiency washing machines as each pack dissolve quickly in all water temperatures. Avoid the messy measuring of dose using liquid or powdered detergents when you wash. With Arm & Hammer 2-IN-1 Laundry Detergent Power Paks, simply toss in one pack for your medium load. The pack easily dissolves in any water temperature, saving you time and effort. The Power Paks are equipped with unique Microcrystals Formula to clean out stubborn dirt and stains on your clothes. Like all Arm & Hammer laundry detergent, the Power Paks brightens your colored fabric and shines your white clothes. Wash your clothes in convenience and peace of mind with the powerful Arm & Hammer 2-IN-1 Laundry Detergent Power Paks. A 3-in-1 laundry solution in one small pack, the PODS Ocean Mist HE Turbo Laundry Detergent is all you need to clean your clothes. Each Tide PODs Ocean Mist pac is a detergent, stain remover, and brightener at the same time. Simply pop one pac for your medium load or two pacs for a large load or three for an extra large laundry load. The pac is quick to dissolve in any water temperature. It is engineered to work well in both front and top load washing machines. Also, it is perfect for both standard and high-efficiency washing machines. Each pac also contains the scent of the Ocean Mist perfuming your laundry with the sweet, crisp floral and citrus smell. Tide PODS Ocean Mist is the all-around laundry detergent you have been looking for. 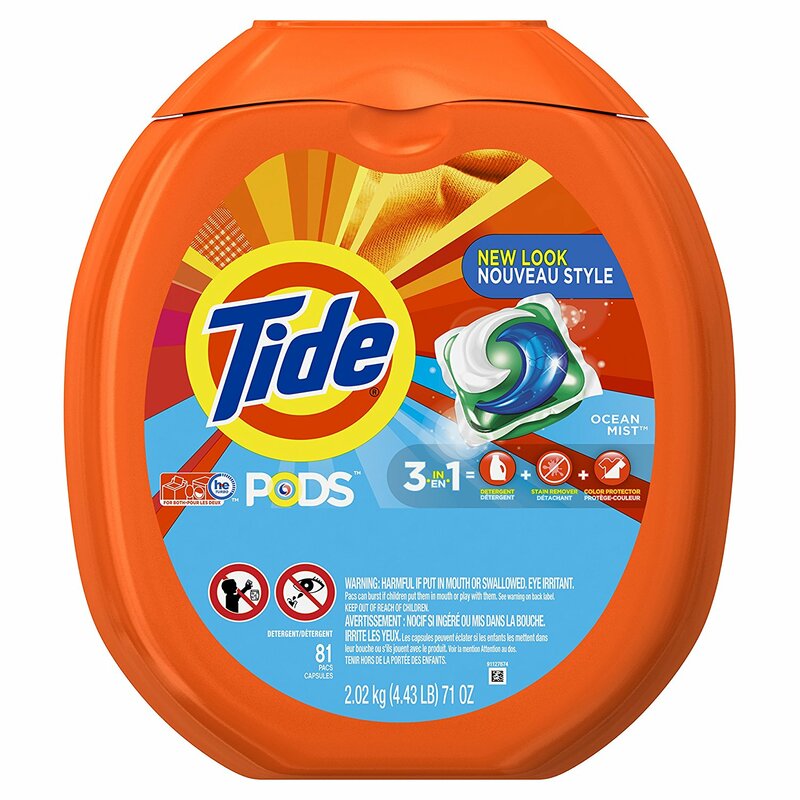 If you want 3 values in 1 small pack, Tide PODs Ocean Mist HE Turbo Laundry Detergent Pacs is the one for you. You don’t need to buy additives to wash dirt and stains off your laundry. Tide Pods work as a laundry detergent to wash off the dirt from your clothes. It is also a stain remover and color brightener. Each pac is also infused with the crisp smell of citrus and flowers to leave you with sweet and fresh smelling clothes after washing. Tide PODs Ocean Mist is also very easy to use. You can save more time and effort from doing your laundry by using this single dose laundry detergent. Each pac is engineered to dissolve quickly in hot or cold water. Simply throw a pac for your medium laundry load and let the pac do the work. Tide Purclean is the first Tide detergent to be bio-based. It contains 65 percent of natural ingredients. Tide Purclean have the cleaning power of Tide. It is superior in cleaning dirt, removing stains, color care, and whiteness. The liquid laundry detergent also helps in energy efficiency as it can be used in cold water. It is free of dyes, phosphates, optical brighteners, and chlorine to be gentle on your skin. Are you looking for a liquid laundry detergent that is free from dyes, chlorine, and other harmful chemicals? 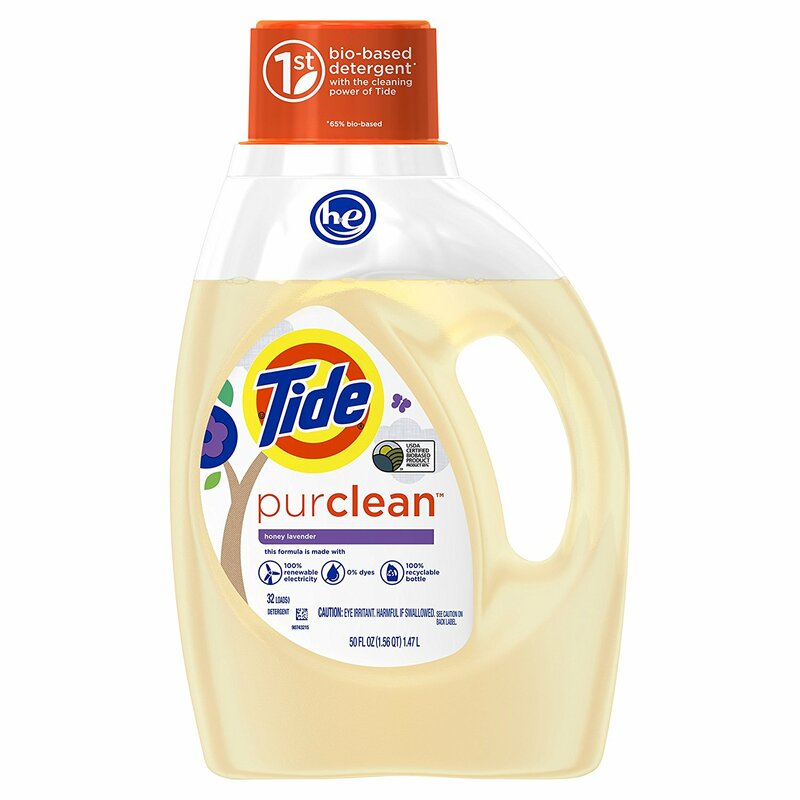 Tide Purclean Liquid Laundry Detergent is the one for you. This USDA certified 65 percent bio-based liquid detergent is safe for the environment and still has the trusted cleaning power of Tide. Made from 100 percent renewable power and has zero manufacturing waste, Tide Purclean will wash off dirt, remove stains, and brighten your clothes. Tide Purclean is effective while using cold water to help you save energy when doing your laundry. It is safe for your entire load whether you are washing whites, colors, cotton, silk, and even baby clothes. Tide Purclean is your laundry partner to help clean your clothes and, at the same time, protects the environment. There are many laundry detergents for you to choose from. Whether you want to use powdered, liquid, or single-dose detergents, choose the one which fits your and your family’s need.